Not only that, once again we did it after surrendering a two goal lead with the equaliser coming in stoppage time from a free kick that was parried by goalkeeper Lee Grant. This time, however, there was no romp through the additional thirty minutes and it was a sigh of relief that greeted referee Craig Sarginson's final whistle. Jay Rodriguez and Wade Elliott had given us a 2-0 lead that looked, to all intents and purposes, to be enough to see us through but it took a goal from captain Chris McCann, incredibly his first at Turf Moor since the 4-2 home defeat against Sheffield Wednesday in February 2009, at the end of the first half of extra time to see us through. It all started in such a way that there looked little danger of Barnet causing any sort of upset. We totally dominated the opening period, a period that run probably until midway through the first half. We didn't threaten enough but it was as if we were getting all the possession of the ball and the game was constantly being directed towards the Barnet goal. There was no real tempo to it and there wasn't enough in terms of creativity, with the best opportunity falling to Ross Wallace who screwed a right foot shot wide having been played in by Rodriguez. If that was a decent chance then the next one was a sitter, but it was down at the other end. Jason Price somehow managed to make a real mess of a chance that fell to him in the six yard box. He'd only Grant to beat but got a poor touch and the chance went begging. That was the signal though for Barnet to step things up and they were starting to give us some problems. Thankfully that came to an end with the first goal of the night. Again, as did the goal on Saturday, it came from a Kieran Tripper cross and this time it was Jay Rod who headed home. There was some real good fortune about it as both the cross and the header took deflections. A 1-0 lead at half time was probably fortunate, but just before the last whistle of the first half we'd been forced into making a substitution with Michael Duff forced off with a knee injury. David Edgar was the preferred choice ahead of Andre Amougou, a somewhat strange choice and Edgar certainly didn't provide us with any evidence to suggest he should be ahead of the Cameroon. It was Edgar who missed the first chance of the second half but we continued to struggle overall in a game that by now had become very dull stuff indeed. Barnet weren't causing too much of a threat and there was no real likelihood of a second for the Clarets. Just past the hour it looked like game, set and match when Trippier played a ball forward, Charlie Austin flicked it on for Wade Elliott who dragged the ball onto his left foot before finishing well from the edge of the box. Barnet boss Lawrie Sanchez, the most unlikely looking manager these days with his goatee and geeky specs, wasn't happy, but he hadn't been happy all night to be honest so yet another complaint I'm sure fell on the deaf ears of the fourth official. Incredibly, the game was far from over. We should have known what to expect, maybe, after the Burton game. Surely though it wouldn't happen again. It did, and it all seemed to change when Barnet brought on Steven Kabba who is on his way back from injury. He pulled one back, but as well as he did to get in there and score, you have to wonder just how Edgar and Ben Mee managed to leave a gap there wide enough for a fleet of buses to get through. It was the third goal Kabba has scored against us, the other two coming in the 6-5 defeat at Grimsby in 2002, and this one really was a bad goal to give away. We had chances to put the game to bed but the third goal didn't come and then, deep into stoppage time we conceded a free kick outside our own box. I even joked that, other than this being on the left hand side rather than the right, it was in a similar position to the one from which Burton took the previous game to extra time. History won't repeat itself I thought, but it did and again Grant failed to hold a shot, parried it only to see them get the rebound. I was initially critical of Grant and having seen it again there is no doubt that he should have done much better. Just before that goal, McCann had come on for Keith Treacy, an amazing winner of the man of the match inside the ground. He set up the winner with a driving run before playing the ball out to Brian Easton. The left back crossed, it bounced around in the box and McCann made no mistake to restore the lead. Thankfully there were no real scares but there was a real sense of relief when the final whistle had blown. It had hardly been inspiring but we were through to the next round. Already seven Championship teams and four from the Premier League are out. We're still in there, with extra time again giving us an extra round. Burnley: Lee Grant, Kieran Trippier, Michael Duff (David Edgar 45), Ben Mee, Brian Easton, Ross Wallace, Wade Elliott, Dean Marney, Keith Treacy (Chris McCann 89), Charlie Austin (Zavon Hines 71), Jay Rodriguez. Subs not used: Brian Jensen, Andre Amougou, Steven Hewitt, Alex MacDonald. Barnet: Dean Brill, Danny Senda, Clovis Kamdjo, Anwar Uddin (Exodus Geohaghan 90+1), Jordan Parkes, Mark Marshall, Mark Hughes, Mark Byrne, Sam Deering (Ricky Holmes 77), Jason Price (Steven Kabba 67), Izale McLeod. Subs not used: Liam O'Brien, Charlie Taylor, Sam Cox, Mauro Vilhete. It's all about Jay Rodriguez again. In the last round he scored four times and his goal in this game has taken his tally in this competition to 7, the other two coming three seasons ago against Fulham and Spurs. 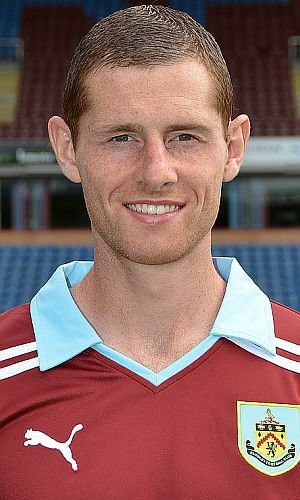 He's one of 102 players to have scored League Cup goals for Burnley and his goal in this game has taken him equal with both Robbie Blake and David Eyres. Five players have scored more League Cup goals for Burnley. He's one goal behind Willie Irvine, Leighton James and Peter Noble, who all have 8 goals. Above them are Frank Casper with 9 and our all time leading League Cup goalscorer Andy Lochhead who has scored 10 goals.